Take a quick and painless hearing test. choose your new hearing device. Clear Sound Audiology was humbled to receive Gainesville’s People’s Choice Award for Best Audiologist in 2017. It is an honor to serve our city and the surrounding community with the area’s finest hearing health care. 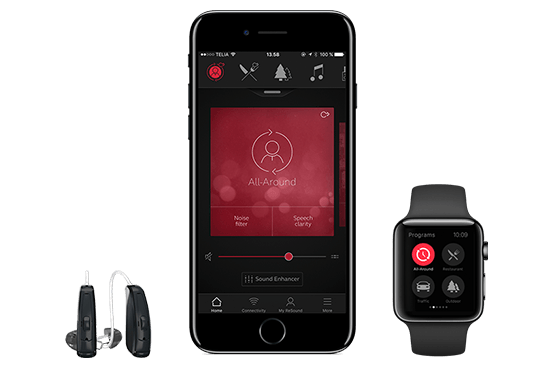 The future of Smart Hearing is here. With the latest hearing technology you will be able to hear and understand more than you ever thought possible. They are better at identifying speech in various environments which can help you hear up to 80% more sounds around you and significantly improve understanding speech in noisy places. The new technology is Bluetooth ® compatible which will allow you to enjoy streaming from your smart device. Hearing problems can be overwhelming and frustrating. It may feel as if there’s nowhere to turn for help. But at Clear Sound Audiology, you can relax and know that you’re in good hands. From our friendly, knowledgeable staff to the relaxing office environment, every aspect of our practice is designed to put you at ease. We start simple. We listen to what you have to say to understand what you’ve been through. We move on to testing and evaluating your hearing to arrive at an accurate diagnosis. Then we discuss the results and explore options and offer affordable solutions to improve your hearing while keeping in mind your lifestyle, hearing, and budget. The goal of our audiology practice is to reconnect those with various hearing needs to their families, friends, and to the activities they value most. We assess and explore each patient’s hearing needs, lifestyle, and their budget before recommending hearing instruments. The audiologists at Clear Sound Audiology are highly trained, dedicated, caring, and strive to educate and empower patients with regards to their hearing.